New Rooftop Spot - Skylight London Is Now Open - What 2? 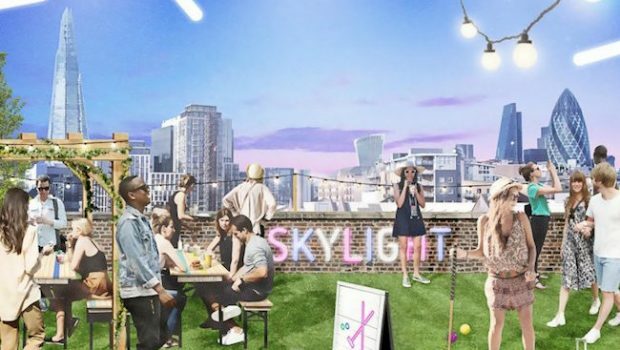 Whenever we hear the word rooftop, we get excited about summer… Skylight is Londons newest rooftop destination to hit the scene. Located in Tobacco Dock and taking over a car park, Skylight London is one not to miss… well once you find it at top! We visited the rooftop and instantly fell in love with the views, food and cool, calm, casual atmosphere. Skylight London reminded us of a giant playground and all we needed was a batch of friends to bring down for a game of croquet and lawn bowl. If you’re looking for a fun filled evening, then we most certainly suggest you rock up and book in a few games. I may not be the biggest game player but I’m defo a fan of sun rays, and Skylight London is a great spot to take it all in. Over 3 levels, it’s always best to grab a seat at the top and get a cocktail while your up there. Oh and lets not forget the street food that’s on offer. Theres many rooftops in town but i personally feel that they all have a little something different to offer. As the DJ was blazing the tunes, I got a strong east London vibe and felt right at home. Now that there officially open, i wouldn’t be surprised of how busy these guys will become…especially as you got it all under one roof.